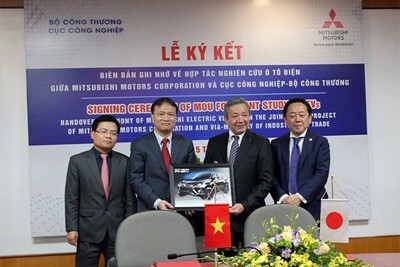 Japanese automaker Mitsubishi Motors Corporation has inked a memorandum of understanding with the Ministry of Industry and Trade of Viet Nam to conduct a joint research for electric vehicles development in the Southeast Asian country. Under the agreement, the Japanese group will cooperate with Viet Nam to study the effective use of electric vehicles as well as policies and programmes to support the speedy adoption of sustainable automotive technology according to Japanese automakers. Mitsubishi Motors’ Executive Vice President Kozo Shiraji said the company looks forward to sharing its pioneering expertise in electric vehicles and exploring how the government policy can support the adoption of this transformative technology. Mitsubishi Motors is seeking a location for its second auto assembly plant worth some US$250 million and having an estimated annual capacity of 30,000-50,000 units. To put the plant into operation in 2020, the corporation expects to locate the plant in a developed industrial park or economic zone near a seaport so that it could conveniently transport completely-built-up (CBU) autos and auto parts. The project is aimed at contributing to Viet Nam’s socio-economic growth and production of eco-friendly electric vehicles in the future.